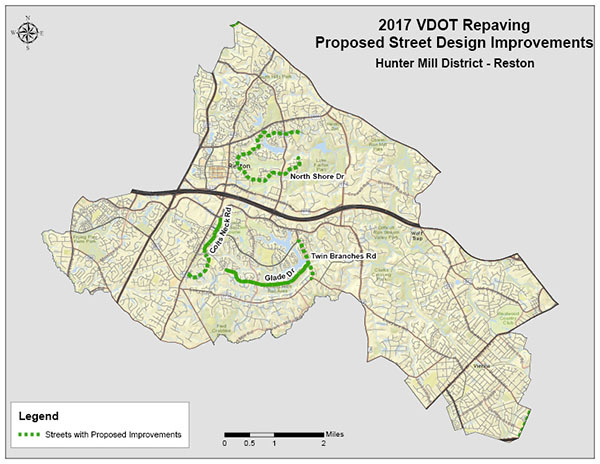 Local officials are looking to hear from the public about proposed bicycle lanes for Reston’s Hunter Mill District as the Fairfax County Department of Transportation gets ready repave streets in the area. Members of the public are invited to a community meeting in the Terraset Elementary (11411 Ridge Heights Road) cafeteria on Monday, Nov. 14, to discuss the possible bike lanes, as well as other ideas to enhance safety for traffic, bicyclists and pedestrians in Reston. Glade Drive, from Glade Bank Way to Twin Branches Road. Twin Branches Road, from Lawyers Road to South Lakes Drive. Colts Neck Road, from Reston Parkway to Sunrise Valley Drive. North Shore Drive, from Ring Road to Oak Spring Way. County officials note that any alterations to the streets are limited to striping changes made during repaving. The community meeting will last from 6:30-8:30 p.m.
For more information, including a feedback form, visit the Hunter Mill Bike Lanes project page on the county’s website.